There are some eczema sufferers that report an improvement in their eczema after ‘cleaning’ their homes of all chemicals (no pun intended!). Personally I don’t use much chemicals at home, for instance, my floor is cleaned with water and we don’t use anti-bacterial wash every time. It can be very difficult to adopt a zero-tolerance for chemical in your life, given how they are in a lot of products, even baby wipes! I do believe though that some individuals’ skin are more sensitive to chemicals than others and therefore for them, eliminating chemicals work well for their eczema. For the rest of us, perhaps a moderated approach to limit chemicals only in certain areas. These are my suggestions! 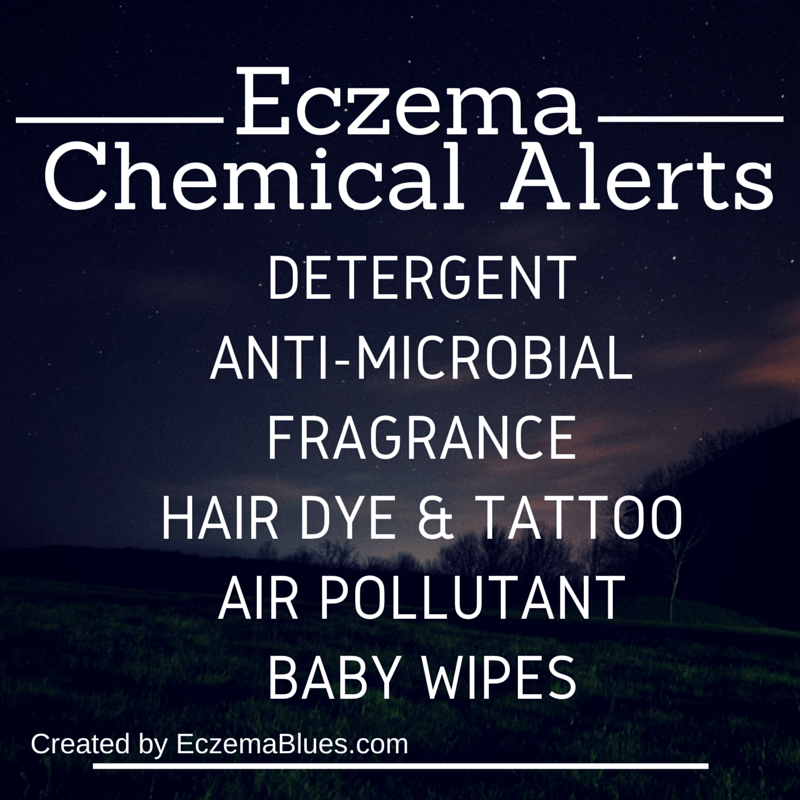 These chemicals irritant and can cause contact dermatitis. What I do is wash using a longer cycle and use a hypoallergenic detergent. It may also mean that the clothes don’t get cleaned as it would with stronger detergent but it beats having eczema. Be careful of new clothes too, wash them before wearing as they also contain chemicals (read this mom’s sharing on trying on new clothes for her eczema child). Increased use of antimicrobial products (ingredient triclosan and triclocarban) lead to prolonged contact through the use of everyday products like dish washing detergent, hand sanitizer, deodorant and soap. This overtime can lead to contact eczema where the skin starts to develop rash when in contact with these, for instance, occupations that involve frequent hand washing tend to get this. Fragrance is undoubtedly the top irritant – avoid fragrance for the whole family with a baby with sensitive skin, as advised by dermatologist Dr Cheryl Lee MD in Eczema and Skin pH, point 7 on allergy avoidance. Other chemicals to avoid are nickel, formaldehyde releasing preservatives, propolis (in beeswax), neomycin and bacitracin. For alternative names to fragrance, see the compiled list from dermatologist Dr Verallo Rowell on Sensitive Skin Products – Top Irritants. Other common irritants for children with eczema is listed in Contact Dermatitis for your Eczema Child and nickel is one that showed up in quite a few studies. Coins and jewelry of nickel has to be avoided for those sensitive to nickel. It would unlikely be affecting eczema children but teens and adults should take care of the potential dangerous effects from using hair dyes (with A-List Celebrity Hairstylist Kristan Serafino on alternative hairstyling tips) and tattoos. Chemicals that we breathe in can also affect allergic condition, like asthma. Read how dermatologist Dr Cheryl Lee avoid VOC paint and redo her home carpeting. Avoid polyaromatic hydrocarbons as well. Baby wipes are a life-saver, especially when traveling. Be careful not to use it on the face though as the skin is thinner on the face and an ingredient in baby wipe methylchloroisothiazolinone or methylisothiazolinone has been linked to cause skin rash overtime. On the point about the air, many food allergens can come into contact with our skin from the air. Especially if you or your child has egg allergy, it’d be best to dine in a restaurant with good air ventilation instead of hawker centre where the ‘egg’ content in the air is higher (something my co-author Prof Hugo Van Bever shared in our book launch). What other chemicals are you avoiding? Share in the comments! Ask #SkinishMom – Why can’t Skincare Product Label be Easier to Read? Another masterpiece – good job. Knowledge enables. Linked to all this is the importance of knowing what is in the stuff that we put on our skin. That is the obvious reason why there should be an informative label on all skin care products, including a “best by” date. For clinicians seeing mysterious rashes a golden rule is to ask to see everything that is being used on the skin – everything! Sometimes the cause of the problem is discovered this way. Thanks Dr B for dropping by, and great suggestion on the ‘best by’ date! I’m thinking also of all the possible heat that affects the product when it ‘travels’ from place to place, wonder if storage instructions are given to retailers – some storerooms can get pretty warm!